NEW! Now You Can Get Infrared And Steam In One Sauna! The Infra Sauna! - See Them On Display In Our Beautiful Showroom. The two main choices you have when buying a sauna are the traditional steam sauna or an Infrared sauna. 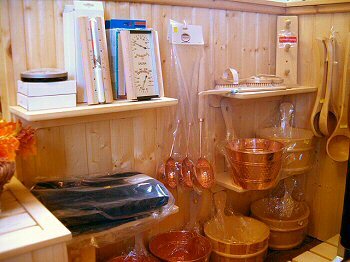 It is not a matter of which sauna is better, but which one will do what you want it to. The following information will help you decide which sauna is right for you. In a traditional steam sauna a fully heated environment is created by a heater that uses a rock mass and the use of water poured over the rocks to create steam. Traditional saunas take approximately 45 minutes to pre-heat the interior of the room for use. (Special heaters are available to reduce this wait time.) To use the room properly, the bather waits until the room has achieved an interior temperature of at least 150 degrees and then will use the room for approximately 15 to 20 minutes to heat the body and induce a sweat. The bather will then come out of the room and cool off for 5 to 10 minutes, which completes one inning. Completion of 2 to 3 innings is the full practice of a traditional sauna but many people reap most of the benefits from one inning. The bather has the ability to adjust the ambient temperature in the room by creating steam off the rocks. This will produce a moist heat that will result in a hotter feel to the body. The use of water also allows the user to do aromatherapy by using oils in the water. Now that you know how a traditional sauna works, you will want to look for certain things before you purchase one. Most larger traditional saunas will take special wiring (a 220 line) to accommodate the heater. Smaller units can be plugged into a designated outlet. The best wood for a traditional sauna is Nordic White Spruce. This type of wood wards off odor and bacteria helping you keep you sauna cleaner. Abachi wood for the seats allows them to stay remarkably cool to the touch in high heat and does not splinter. Your sauna heater is the most important part of your sauna. Things to look for in your heater are a good warranty, low energy consumption, ease of use, and a large amount of rocks used in the heater. Another important factor is how long has the company been manufacturing their saunas. In an infrared sauna, the bather is being heated directly by the infrared heat source and the air temperature in the room is only a default of the infrared emitters. An infrared sauna takes approximately 15 to 20 minutes for the emitters to come up to temperature. (Approximately 115 to 135 degrees F) When using the infrared, the bather waits until the infrared emitters in the room are running at full heating potential. The bather then sits next to the emitters in order to allow the body to be heated directly by the infrared radiant heat. The bather will use the room for 20 to 30 minutes in order to induce a deep sweat and once this is achieved the bather has completed the sauna practice. The bather can achieve a more direct effect of heat therapy to portions of the body based on how closely that portion of the body is exposed to the actual emitters. The most important thing to look for when purchasing an infrared is the infrared emitters. You will want to get an infrared sauna that has the largest surface area of emitters. Carbon flex panels will provide the best wavelength for the body to absorb and will provide a softer heat, evenly dispersed. Finding an infrared sauna that has emitters in the leg area as well as the upper body will eliminate your legs from feeling cold. Added features that are nice to have are stereo’s and color light therapy. Most infrareds are 120 volt, which allows for a no hassle install and they usually don’t require additional electrical wiring. Always check what kind of warranty comes with the unit and how easy is it to install. As always, the reputation of the company you are buying from is essential. Now that you know the difference between the traditional and infrared sauna, pick the one that best suits your needs. You are sure to reap the health benefits no matter which sauna you choose. The benefits awaiting you are, cleansing the body of toxins, restoring sore and tired muscles, relieving arthritic pain in joints, lowering blood pressure, increasing blood circulation to speed up the healing process, cleansing the body of dead skin cells and giving the skin a soft, beautiful appearance, increasing your resistance to illness, burning calories, getting a deeper and more restful sleep, and the added benefit of breathing in the steam in the traditional sauna helps relieve cold and sinus symptoms. Remember that the benefits of sauna therapy not only feel good but also are good for you, and are a great investment for your health. Traditional and Infrared Saunas offer nearly identical health benefits when designed properly. The big difference is in how they deliver the heat and the traditional sauna allows added benefits from steam. The following is a list of the benefits you will receive from saunas. 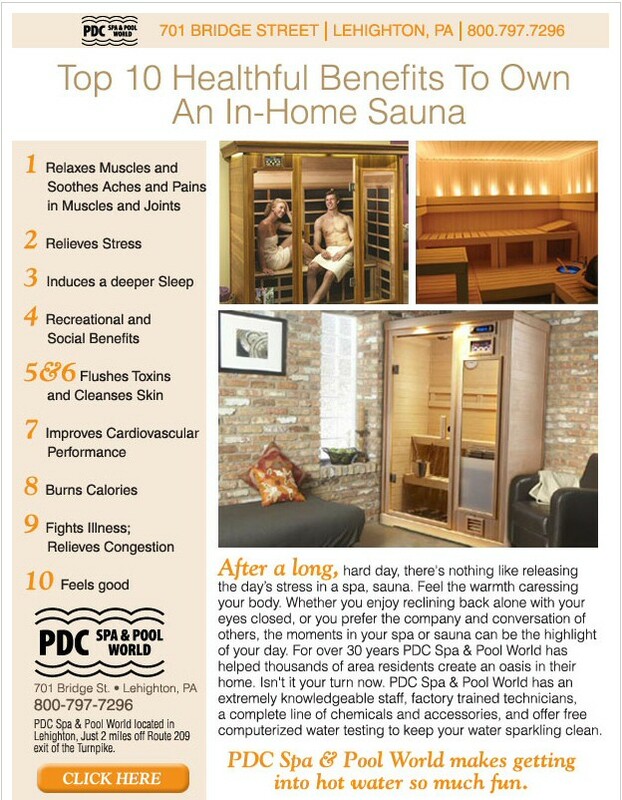 The following are some things to look for when purchasing a sauna. With the wide variety of traditional and infrared saunas available, there is sure to be one that meets your needs. © 2008 PDC Spa and Pool World Inc.
PDC Spa & Pool World has saunas on display in our showroom as well as knowledgeable and friendly staff that are ready to assist you and answer your questions.